Call av and a list of your top-level apps at /Applications and /Applications/Utilities will be shown with their version numbers. Action any of them and the version number will be copied to the clipboard. If the app you want to check the version of is located anywhere else, you can find it and use the File Action on it for the same effect. This will also show the version as Large Type. 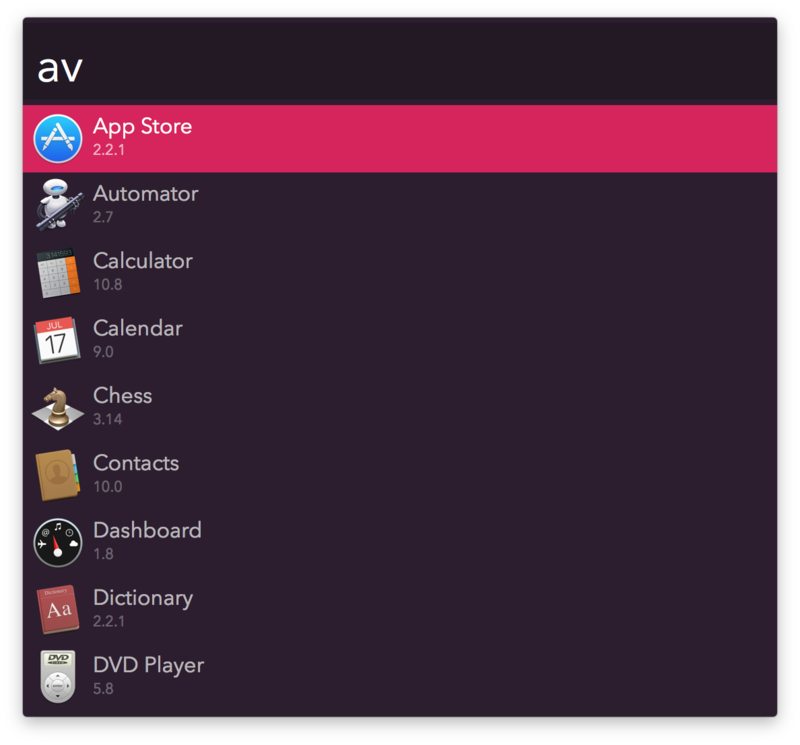 Running av exposes the harsh reality of how many apps I have on my system. It takes legit 20 seconds to get some results back. I updated the workflow to include the fast fetch of version. 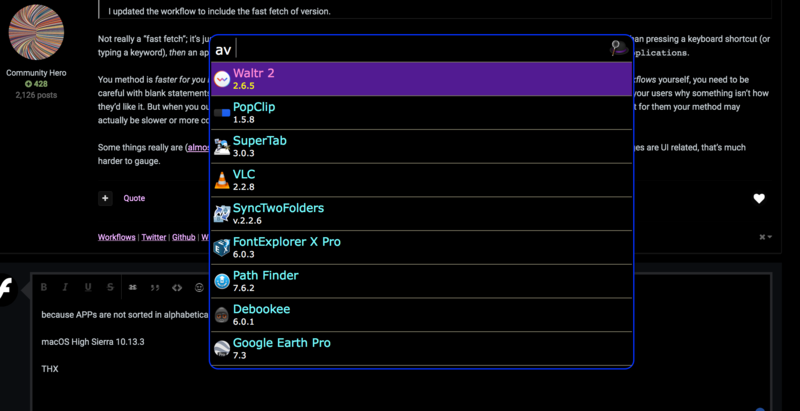 It is a simple file filter that filters through apps and on result will put the version number into clipboard. Here is the modified workflow if you want to add it. ? It's one of those things that I didn't know I need. No more wasting time getting the version number of VS Code when submitting a bug on GitHub. I updated the workflow to include the fast fetch of version. Not really a “fast fetch”; it’s just a different way. Typing an app name followed by ⇥↩ (App version is already at the top) is faster for me than pressing a keyboard shortcut (or typing a keyword), then an app name and ↩. The File Action already on the Workflow is also more useful, since i’s not constrained to /Applications. You method is faster for you in certain specific situations. I appreciate your desire for speed, but as a Workflow developer that shares his Workflows yourself, you need to be careful with blank statements like that. It’s alright if you say “I’ve built it this way because it’s more convenient for myself”, as that justifies to your users why something isn’t how they’d like it. But when you outright say “this is faster/better”, you’re ignoring your users are different people with different workflows, and that for them your method may actually be slower or more convoluted. Some things really are (almost) always better and faster than the alternatives, but those are usually down to the code level. As soon as changes are UI related, that’s much harder to gauge. because APPs are not sorted in alphabetical order? could you include the utilities folder? Done in the latest version. They are. If they’re not for you, it’s a weirdness in your setup. Upgrade to the latest version, open the debugger, set the log output to “All Information”, and post the output. @franctastic Do you have your macOS in a non-english version? That’s likely the issue. I’m not going to take that into account in the Workflow. You can always type to filter by app name. are in the same order as the launchpad. Mine is set to English, (US) using 10.13.3 beta formatted as APFS w/ FileVault enabled, and no alphabetical order of items. Would you still like the debugger info posted here ? Ah never mind here it is...Just incase you can use it. --Snipped the remaining were just continuations of the apps installed. Not sure where the issue lies, but so far it seems to happen on High Sierra. I’m still not on it, so can’t properly debug yet. Apps should now appear in alphabetical order regardless of file system. Would it be possible to show it if it is in the applications folder or in the Utilities folder? I’d rather not, and maintain the cleanliness of the list. some applications are inside folders, for example, all Adobe programs. 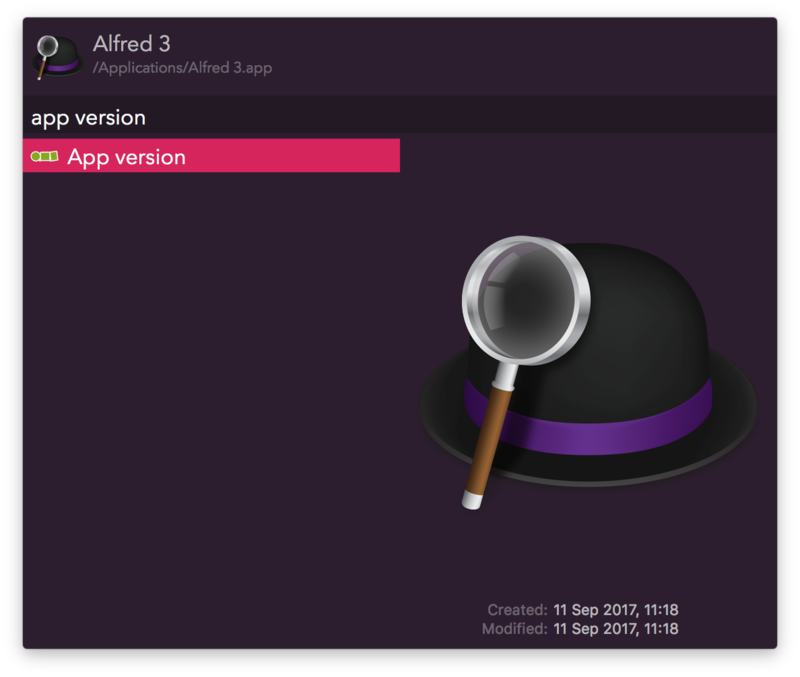 These applications do not appear in Alfred, any Adobe program. That is on purpose. Doing an infinite recursive search would make the results take too long to appear. If you want versions for those apps, use the File Action. because infinite? with a single level is enough. Microsoft uses the same system in the Office for Mac. with a single level is enough. Not for every case. Also, a lot of apps that are distributed inside a suite have a lot of accompanying apps that are helpers with arguably no interest. This Workflow was itself started as a favour/request; I don’t even use it. I think it’s already good enough to cover most cases, and as such I have no plans to continue spending my free time on it to add features that benefit a single user. As stated previously, the File Action works just as well. The code is open-source, so you’re free to modify it to your needs. That was introduced on January 22. Oh well, just doing some spring cleaning and noticed it now worked. I have been on beta (Apple) for so long maybe something was borked on my end. I did a clean install a couple weeks back and just now getting my Mac back to "just so". Anyway carry on. ?